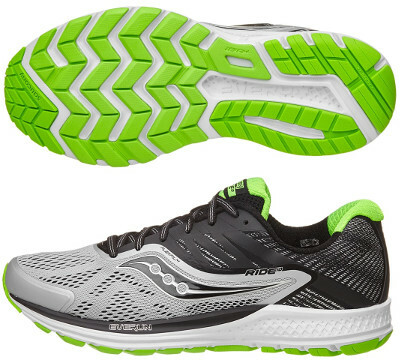 Saucony Ride 10 are neutral cushioned running shoes. The Saucony Ride 10 tries to consolidate EVERUN™ technology in tenth edition from the versatile running shoe from the american brand. Innovation is the only way to success within long tradition competitors like best seller Asics Gel Cumulus 18 or extremely popular Nike Air Zoom Pegasus 33. With typical 8 mm drop and great blend of cushioning and response, the Ride 10 is a great choice for daily workouts and long runs, particularly half and full marathons. As usual, updated upper is the major highlight compared to its predecessor Ride 9. Big holes in forefoot increase ventilation for improved comfort while fused overlays (FlexFilm™) have been relocated for better fit. As seen on other running shoes from Saucony, interior lining from both ankle collar and tongue are made of RUNDRY™ fabric for great breathability and odour control resulting in optimal sanitation. The other big change in Ride 10 takes place in midsole visually similar to Kinvara 8 which also maintains EVERUN™ topsole layer just below footbed but replaces SSL EVA foam with PowerFoam™, maybe a step in the right direction or just another trial/error until reaching perfect balance. Outsole slightly reduces grooves in the forefoot but keeps TRI-FLEX configuration like in its counterpart with pronation control Guide 10 for great flexibility and smoother ride. Materials remain unchanged using lightweight and flexible (IBR+) in the forefoot to enhance cushioning and responsive ride while more durable carbon rubber (XT-900) in more exposed areas to offer reliable traction even on wet paths.